John Baccala stood in a parking lot in the Northeast Industrial District of Kansas City, Missouri, and raised his voice over the auctioneer’s bid calling. “Every one of these cars has a story,” said Baccala, the communication/community liaison for the city’s Neighborhoods and Housing Services Department. Baccala has seen more than 5,200 cars pass through the Kansas City Tow Lot, the city’s impound lot, this year alone. They were abandoned, hit or stolen before the city picked them up. The owners of the cars are notified, but if the vehicles are not retrieved, they become available to the public for live bidding the third Tuesday of each month, including the one scheduled for today. 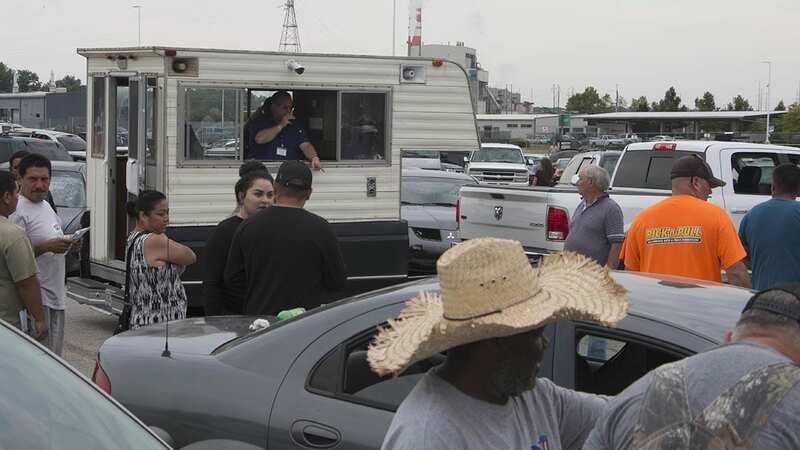 The third Tuesday in July the vehicles ready for auction sat in the city’s impound lot with shattered windshields and dangling bumpers, while bidders vied to claim them for the best price. Patricia Nolan, 24, a first-time bidder at the July auction, had her sights set on a black 2011 Kia Sorento, which she saw in a listing online. After researching the vehicle, the Kansas Citian arrived at the auction in hopes that she would place the winning bid. The Kia that Nolan wanted was newer than most of the cars the Tow Lot has seen this year. Most were from the early 2000s. Overall, the date range was large: The oldest car auctioned off was from 1952, although the city’s data doesn’t list its make or model. And the past year’s auctions included four vehicles from 2018: two Ford F-150s, a Volkswagen Jetta and a trailer. Ford was the most common make auctioned off last year, and the top model was the Taurus. Honda Accords, Chevrolet Impalas and Ford Explorers also frequently appeared. Other cars were rarer. Some were from traditional luxury brands, like the 1983 Porsche 944 and a pair of 2004 Cadillac Escalades. And Tow Lot auctions aren’t just for cars: Last year, five Harley-Davidsons, four motor homes, a boat and a Vespa were auctioned off. In the last year, more than a third of the cars arrived at the Tow Lot because they were involved in an accident, and a quarter were abandoned. Abandoned cars tend to be older than ones in accidents. A substantial number of cars also ended up in the auction because their owners were arrested or the vehicles were illegally parked or stolen. Baccala said the city wants the owners to retrieve their cars, but if that doesn’t happen, the vehicles go to auction. The Tow Lot notifies the owner that his or her car is in the lot. The owner then has 30 days to collect the car. In order to do that, the owner must pay the cost of towing, which starts at $265, and the cost of storage for each day, which starts at $30 per day. There is a discount on those fees for stolen vehicles. Baccala said that the car auction works out well for the city. Last year the auctions made around $5 million, which helps the Tow Lot stay self-sufficient, he said. The Tow Lot draws a regular crowd. Baccala said that every month they see “regulars” from salvage companies and “pick-and-pull” businesses. He said many of them bid on cars in bad condition for scrap metal or parts. Most cars arrive in poor condition, and the city’s data show that the engines started in just 5 percent of the cars auctioned off last year. Nearly all of the cars with working engines had been stolen. Those cars with working engines or that need fewer repairs are considered “premium” vehicles and usually draw higher bids at auction, Baccala said. The Tow Lot auctioned off an average of 15 premium cars per month in the last year. The Kia that Patricia Nolan had her eye on was one of the “premium” cars in July. She bid on the car but stopped when the price exceeded her range. The vehicle eventually sold for $1,700, she said. Nolan was like many other visitors to the monthly auction — interested in a vehicle and hoping for a great price. Check out the list of cars up for auction this month here. — Lindsay Huth and Michelle Stoddart are multimedia reporting interns at Flatland.